Dial your heart and connect to God for free!SUPER UNLIMITED CALL... NO EXPIRY! HA! Fantastic! I love it! Simply LOVE it! Smiling and thinking! Have a wonderful day! what a great verse, it is. A blessed day! Ha! Love that! Makes me think of Jer. 33:3 or Ps. 91:1. Calling on the name of the LORD!! 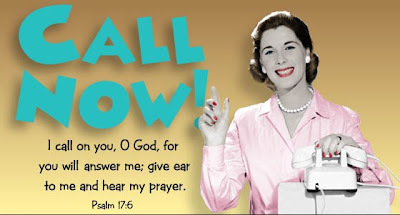 How often in our lives.....I think especially when we are younger it is far easier to reach for the phone and talk than bend to our knees and pray.